Barcelona moved ten points clear of their nearest rival with a hard fought win at El Madrigal. Goals from Keita and Henry helped Barca to continue their unbeaten streak after Barca have gone behind from a goal from Cani. To make things worse Barca's Pique was sent off and had to hold off with ten men in the final ten minutes. But overall it was a very satisfying, tough and hard fought victory. Pep Guardiola chose Busquets ahead of Toure. Alves, Pique, Puyol and Alves formed the back four. 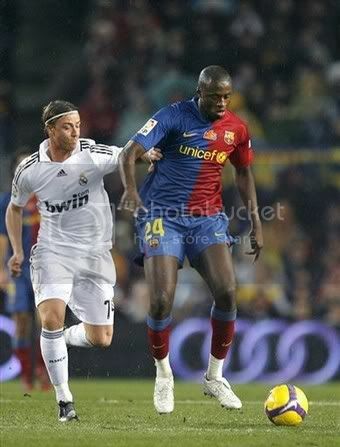 The midfield as expected were packed with defensive players with Xavi partnering, Busquets and Keita. Henry, Messi and Eto formed front three. Messi had another quiet game by his standard but it was good to see Xavi hitting top form. Barca as expected dominated possession from the beginining, but couldn't break an organised defense. Majority of the chances in the first half fell to Henry and he did waste a few of them. There were questioned raised about Barcelona's ability to respond after going behind against quality team; that should temporarily subsidise now. Just after the breakCani put Villareal forward with a neat finish afetr the defense failed to keep hold of him. Barca responded vigourously and was rewarded by the goal in the 54th minute when Keita lept bravely in front of Diego Lopez to head into the empty net. Then in the 66th minute Henry put Barca ahead with a great volley from a Xavi cross. Then in the 74th minute Pique was sent off picking his second card in a space of three minutes. Reduced to Ten men Guardiola brought Caceres for Henry and re-organised the defense. With the one man advantage Villareal started pressing in the final moments and should have equalised but Nihat and Franco wasted their chances. 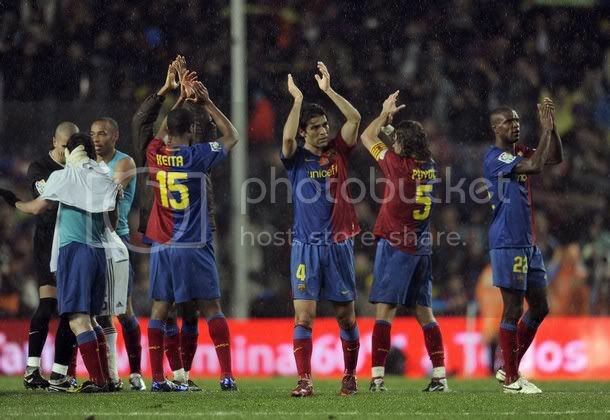 FC Barcelona would be playing their last match of 2008 against Villareal at El Madrigal. FC Barcelona enter this match clearly knowing the fact that a victory at Villareal's home would take them eleven points clear of their rival. Real Madrid continued with their recovery under Ramos with a hard fought home win against Valencia. That lose of Valencia means Athletico Madrid who won against espanyol hold the second spot. A victory for Villareal would take them to the second spot. Barcelona would love to end this 2008 in a great note with a victory against Villareal; that would do justice to the way they played and fought in recent matches. Traditionally FC barcelona have struggled at El Madrigal and would like to correct that here. This is going to be a really tough match for Guardiola and there were questions asked about the squad after the Real Madrid encounter. 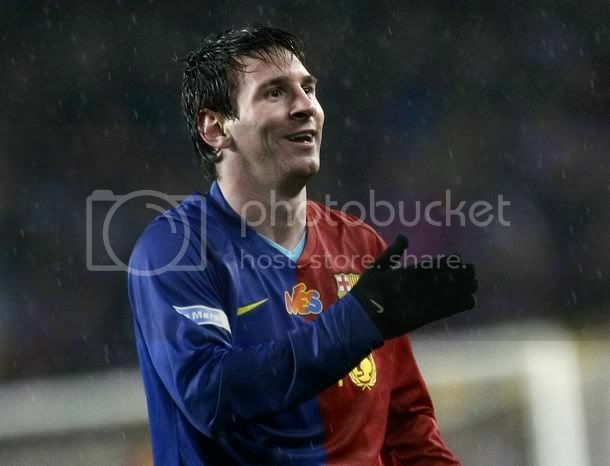 Especially Messi, after a not so brilliant Classico performance he wanted to get things right back on track. The squad selected for the Villareal travel is Valdés, Henry, Xavi, Piqué, Puyol, Cáceres, Sylvinho, Bojan, Eto'o, Messi, Hleb, Dani Alves, Abidal, Keita, Gudjohnsen, Touré, Pinto, Sergio Busquets and Víctor Sánchez. Marquez is injured and hence rested; there were reports of Iniesta being given green signal by Medical staff but he is also rested. The side should be similiar to the recent starting eleven. Valdes should start at the Goal. Abidal, Puyol, Pique and Alves should make the defense. Xavi, Toure and Busquets would be making up a very tough midfield. Eto, Henry and Messi would be the attacking trio. Messi has to lift his game as the midfield would be packed with more defensive minded players. This would be a tough match and expect a tough Barcelona victory with a score line of 1-2. Xavi Hernandez has signed a new deal which would keep him with the club till 2014. And if some club manage to convince him to move away they would have to sell out a whooping 80 million Euros as buyout clause. This ia a welcome relief for Barca who took sometime to ready this contract. This also effectively ends the rumours of Xavi moving out of Barca. Actually Guardiola had made it clear from the onset that Xavi is the most important part in his puzzle. Exact contract compensation is not known but it is rumoured that Xavi will become the third highest paid player in barca after Messi and Eto. Xavi has reitered his dream to retire at Barca. I know one person who would not be happy with handing out lengthy contract to players is Cryuff. But with the tough competition out there FC Barcelona have to shell out a deal which is better or on par with others can offer. It is rumoured that he will make 7.5 million Euros per year. Xavi Hernandez is one of the most prized outout of Barca's excellent youth system. Xavi made his debut in first team on August 18,1998 against RCD Mallorca. He quicly went to become an essential part of FC barcelona's title team. 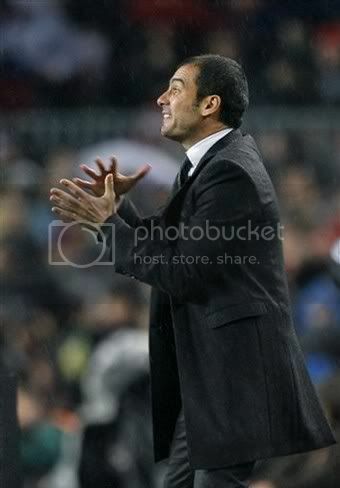 Xavi is considered an ideal replacement for Guardiola, the current Catalan coach. Xavi has become a essential part of the Spanish national team. He was elected as the player of the Tournament at the Euro-2008 when an under achieveing Spanish side fianlly won a trophy. 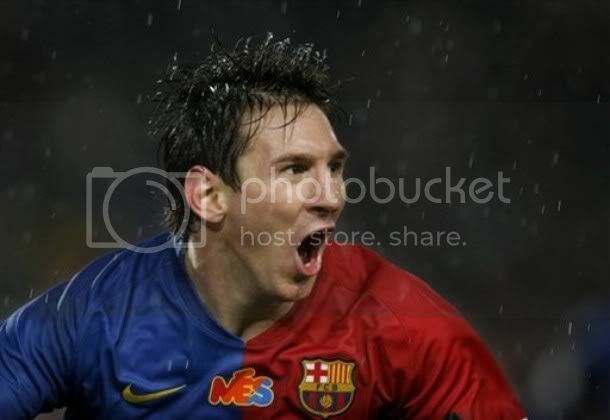 He has scored 29 goals for Barcelona and 8 for Spain; and created numerous goals for his team mates. FC Barcelona once again got an easy draw compared to their opponents in the Champions League second round. FC Barcelona has been drawn against the French Champions Olympique Lyonnais. Like FC Barcelona Lyon is on the top of their respective League. When I say that Lyon would be an easy draw, it just mean that out of the all possible opponents Lyon would be the easiest (no insult to Lyonis meant here). It would be a Herculean task for Barcelona to get past the French Champion. They got quality players like Benzema, Juninho, Govou in their line-up. But I already metioned in my previous post Champions League Opponent that I would prefer to play Lyon compared to an Inter or Chelsea. Lyon would be playing a much more open game rather than the other two opponents and that increases FC Barcelona's chances of proceeding to the next round.Last season FC Barcelona and Lyon met in the group stage; Barca won the home leg comfortaby but drew in the away leg. FC barcelona has scored 18 goals in their Champions League campaign and Lyon are not far behind scoring 14 goal; that makes this the most exciting tie of the second round. There are some serious rivals being joined once again in thos ties, like the Mourinho vs Ferguson rivalry, Madrid would be facing Liverpool and to make things worse would be playing the second leg away; Villareal looks to have got a much easier draw - but when you put this into perspective that Panathinaikos quialified ahead of Inter; that makes thing tricky. Athletico Madird also looks to have a good draw against Porto but plays the second leg away. Two months ago I used to dream of a day when Victor Valdes would really keep a clean sheet. Now Valdes have kept a clean sheets for three successive matches that too against the likes of Sevilla, Valencia and Real Madrid. This would have given Victor Valdes some breathing space and a temporary stoppage from being ridiculed as the biggest blunder of FC Barcelona. 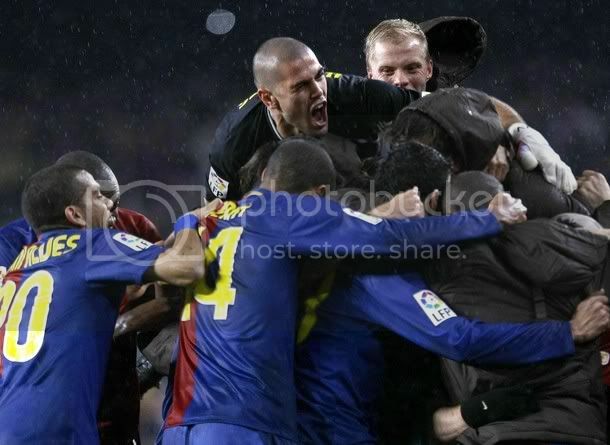 Victor Valdes have played an essential part in the 2-0 victory against Real Madrid. 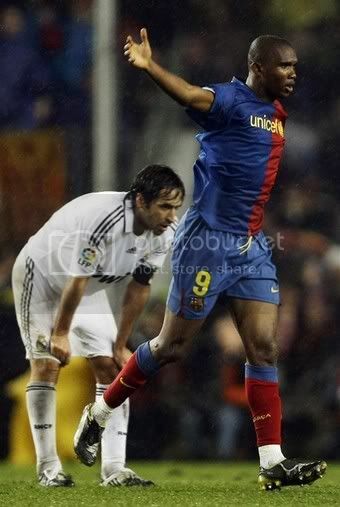 In many fans' opinion including mine, he was deservingly the "Man of The Match" in the "El Classico". Now that's another surprise isn't it? Who would have thought that in an "El Classico" edition the Goal Keepers would come out on top? 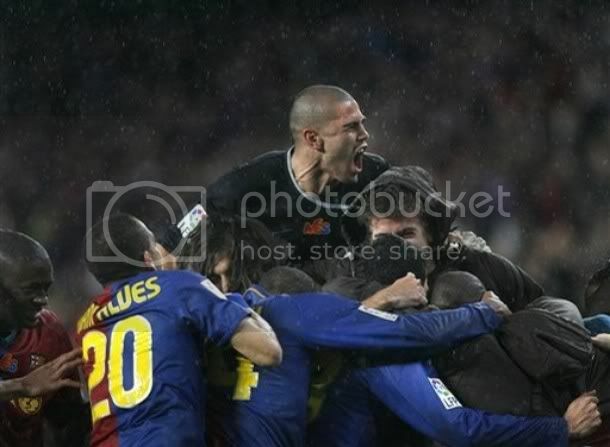 Victor Valdes at this moment may be in a very much confused state; that too without sipping a single shot of Tequilla. Then, you can't blame him for that. Suddenly the world especially Barca fans have started to see the brightest side of him. Everyone is throwing praise at him from all sides. Do he really deserve this? His performance against Real Madrid was outstanding. If we have conceded the goal early then the outcome of the match could have been different. But then if you look at Valdes career he has been like this from the age he have started his first division career. Goal Keeper's can be categorized into five types - Legends, Great, Good, Average and 'Oh My God! How the hell is still there?' types. The Legendary ones are the likes of Yashin, Banks etc. Kahn, Buffon, Cassilas, Chilavert, Lehman, Cech all should fall in the Great list. Valdes is the Good type of Goal Keeper - by 'Good' I meant that he will be good for the majority of the match but still is bound to make a couple of blunders. These mistakes in most of the time would unharmful and sometimes could be really harming; and at that point they need the defense to come to their rescue. That was precisely Valdes biggest problem. Valdes have covered the defense many times but you cannot say the same for Barcelona defense. Each time Valdes made a mistake, the Barca defense failed to cover him up. That gives the mistake an unimaginable proportion and you can also say that whenever Valdes makes the smallest of mistake he is sure to have conceded a goal. Ok, these mistakes don't cover his certain blunders like throwing the ball in the path of players like Villa and Torres. The problem for Valdes is that he is a part of a big club, big interms of both achievement and history. A club who can afford the best in the business and that makes Valdes life very difficult. Unjustified comparision with Buffon and Casillas are being drawn out at every juncture. FC Barcelona fans were crying for a better replacement for him not so long ago. But these fans never look into the reality of the situation. Chelsea is not goint to let Cech leave; even in the worst times Juventus held onto Buffon dearly and Cassilas moving out of Madrid and that too to Barca will happen when Armaegadon arrives; Van Der Saar will remain in ManU for rest of his career. Now with whatever options available I believe Valdes is the best option available. He is the best probably better than Casillas when it comes to one-on-one sittuation. I read an article in Goal.com saying that Drenthe did a charity by hitting the ball straight at him; tha's ridiculous. Valdes have done this many times before. If Henry was so frustrated after the Champions League final of 2006, it was because of Valdes. 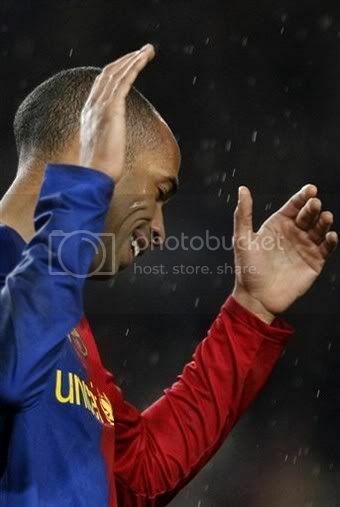 Henry had two great chance to put the match beyond Barca's grip but both the times he ran into Valdes. 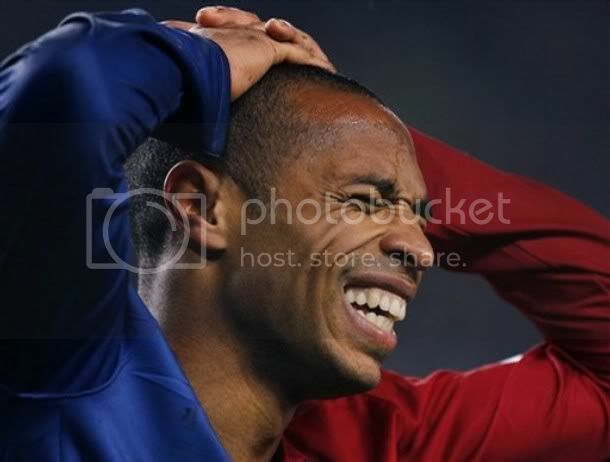 There were some stupid reasons given at that time also that Henry was tired as Arsenal was playing with 10 men. But no one remembers Valdes' contribution everyone remembers Belleti's winning goal and Eto's equaliser. Then Goal Keeping has been the most unthankful job in the soccer proffession. After a great season with two major trophies the football Journalist fraternity never thought it is good to have Casillas in the top three of Ballon D'Or. The purpose of this article is not to project Valdes as a great keeper, simply because he is not. But he is the best at this moment we can have. It will do him a world of good if the fans accept the fact that he is bound to make some mistake in a couple of matches. It will also do him a world of good if he don't get carried away by the sudden praise, as I am pretty sure he will be commiting some silly mistakes pretty soon. Hoping heavily that the defense cover him up on his mistakes; I am stopping this article with only one prayer - "Valdes, don't throw the ball straight to the likes of Villa, Torres etc. If you do You will be screwed buddy". 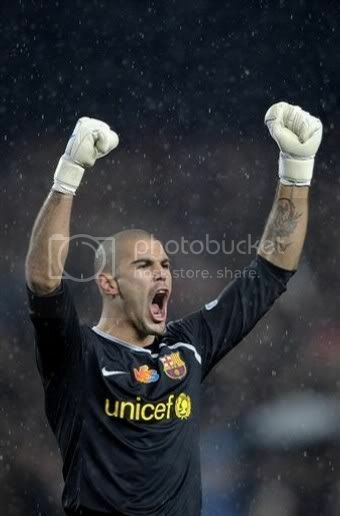 Valdes - 9 - For me the Man of The Match of this victory. Produce crucial saves in critical time to to deny Madrid. Have silenced his critics with a stellar of performance. 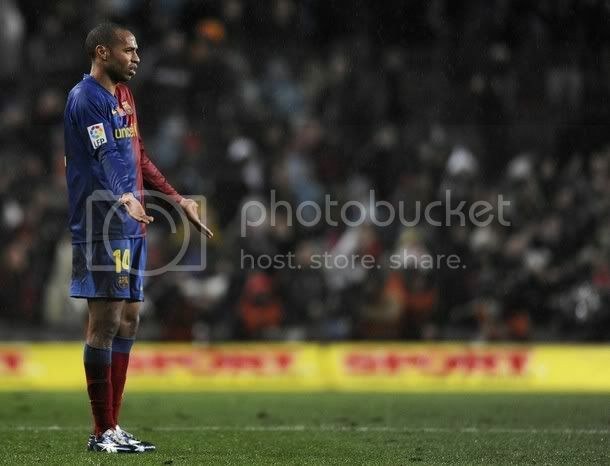 Alves - 7.5 - Did well during this match. Going forward did well but was caught out once or twice in defense. 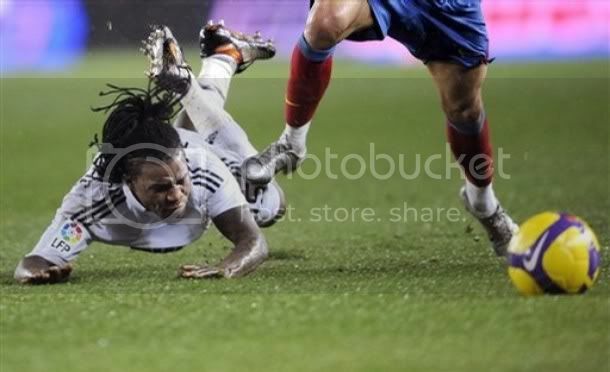 Then can't blame him as he was trying to instill some pace after Xavi went missing in the match. Marquez - 8 - Great game by the Mexican captain. Was so assured in the defense. 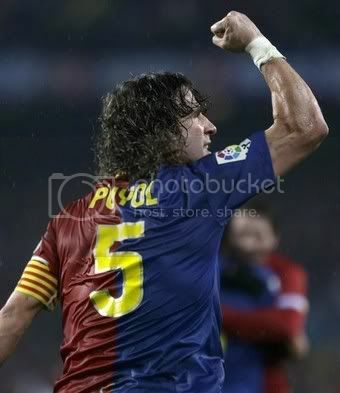 Puyol - 8.5 - Great game by the captain. Created the goal. He was given space to move forward but could not use that, then he is a defender. Produced many crucial intervention. 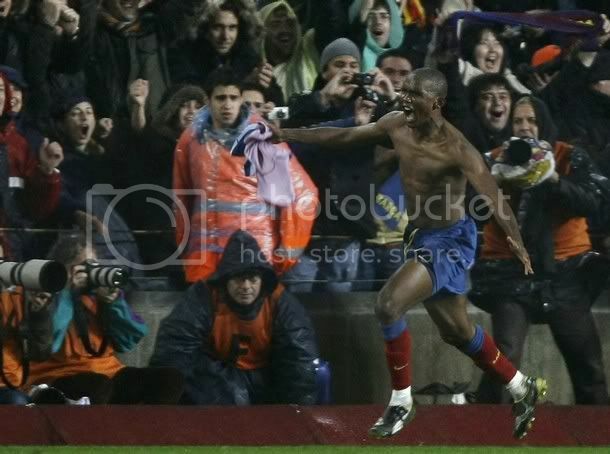 Abidal - 7.5 - Another solid performance. Did not make any mistake in defense, but could have done better while going forward. Xavi - 5 - Disappeared in the game very early. He could not get involved in any move. That left Messi exposed in the left flank. Toure - 8.5 - Another brilliant performance by the Ivory Coast international. He neutralized the Real Madrid midfield effectively. But I would like to him not to do tricky moves while defending. He pulled all those well. Gudjonsen - 6.5 - Was better than Xavi, but could not create and chance or good ball. Messi - 7 - Did well in the initail stages but got tired of getting kicked regularly and that took the fiss out of his game. But did well to get the gall with a great finish. Eto - 6.5 - Had a forgettable night. Then with two creative midfielders out of rhythm it was difficult for him to get the ball. Missed the penalty but did well to grab the goal. Henry - 7.5 - Was the better of all attacking players. He actually got involved in all the moves. Busquets - 8 - His introduction did magic for the team. Won a penalty and was good to see him going forward. For all those including myself who expected FC Barcelona to roll-over a confused Real Madrid side, this may not have been a great performance but neverthless FC Barcelona has won their first El Classico in three years and most importantly is now twelve points clear off Champions eal Madrid. This was a match where Barca were desperate to win and Madrid desperate not to lose. It took two late goals from Eto and Messi to seal the first edition of the "El Classico" this season. Real Madrid's new coach knew that he have to stop Messi to make sure that Barca ran away with the game, and his adfvice to his players were to kick Messi. Messi was kicked really aggresively by Madrid player's and it was a shame that referee Luis Medina Cantalejo never booked a player for those challenges. It was clear that Madrid players were taking turn in kicking Messi. This could be a style which the best in Europe will also employ stop him; and it did worked as after the initial burst that kept Messi quiet. 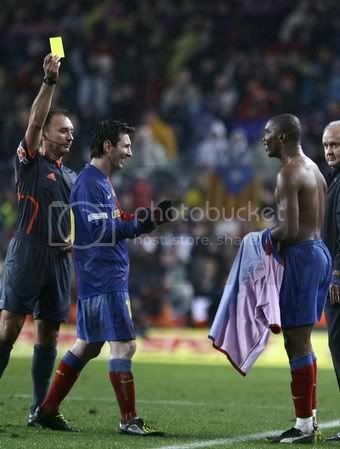 But neverthless Messi had the last laugh. The starting line-up was exactly same as the one which started against Valencia. 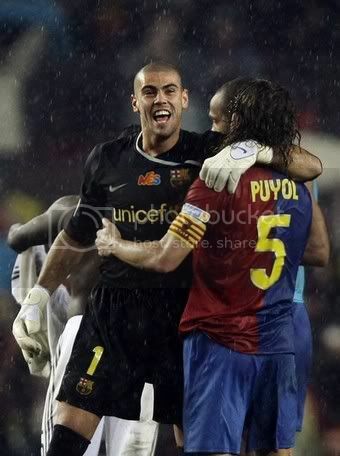 Valdes started in the goal and ahead of him Abidal, Puyol, Marquez and Alves formed the defense. 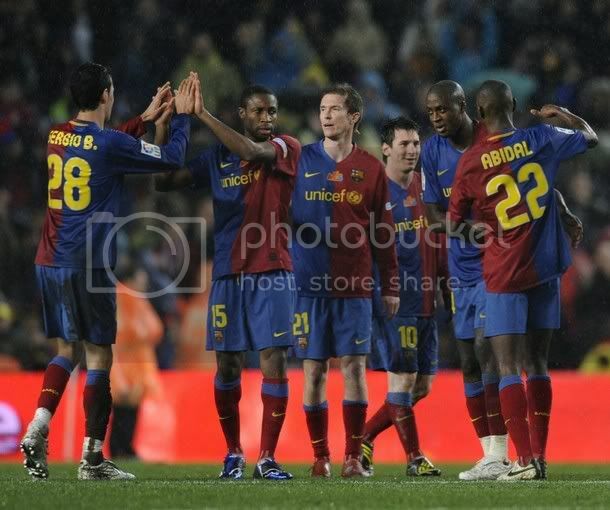 Gudjonsen, Xavi and Toure formed the midfield. Eto, Henry and Messi formed the front three. 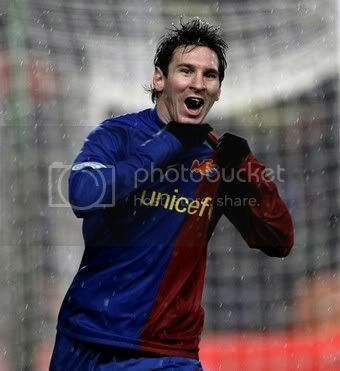 The match started with Barcelona dominating completely. In the 6th minute Messi cuts across Ramos inside the box but Iker Cassillas produced a diving save to deny him. In the 7th minute Henry shot went agonisingly wide of the near post. Madrid's tactic was to tight mark the creative players and that resulted in Puyol and Toure bringing the ball forward but none of them could find Eto. In the 24th minute Valdes was suddenly brought into action when he had to tip over Sneijder's excellent shot. In the 26th minute Valdes demonstrated how good is he in one-on-one situation. Raul played in Drenthe ahead and puyol made a mistake of diving to get the ball early put Drenthe with acres of space infront of Valde. Valdes kept his coll and brought in an excellent save one resembling the save he brought out against Henry in Champions League final. In the 33rd minute Henry saw his effort easily saved by Iker. The referee ended the game without playing any injury time. Overall Barca dominated the first half but the better chances fell to Madrid. The second half also started in the same fashion. 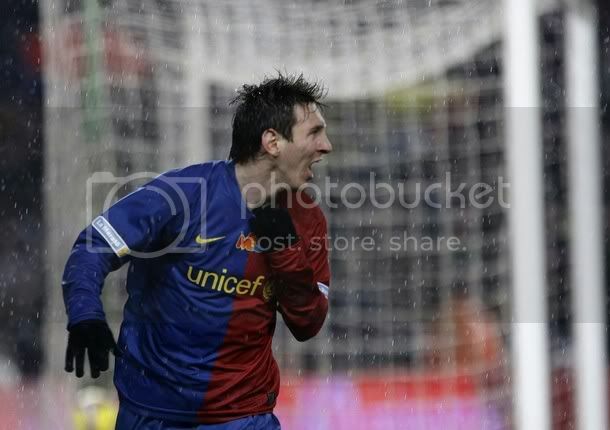 In the 48th minute Eto shot was saved by Casillas after a great cross from Messi. 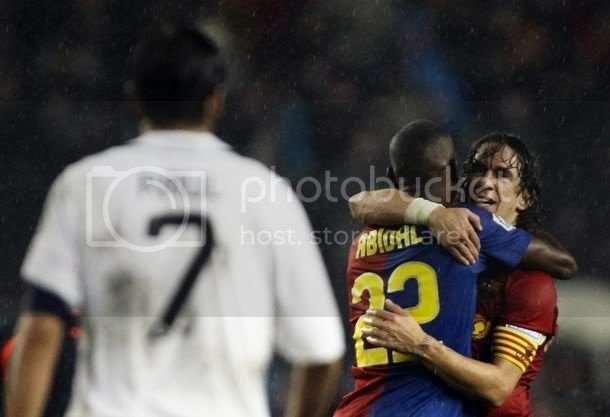 In the 49th minute Puyol produced excellent defending to dent Madrid a sniff of a chance. In the 63rd minute Guardiola took off Gudjonsen and replaced him with Busquets. That instilled pace into the side and in 69th minute Busquets won a penalty when he was brought down by Salgado. But Eto's penaly was very well saved by Iker. In the 72nd minute Eto almost made up for that penalty miss but his shot was saved by Casillas and he produced another save to deny Messi from the rebound. In the 78th minute Valdes made another save to deny Palanca. In the 79th minute Referee didn't give a clear handball against Metzelder in Madrid's box. But in the 83rd minute finally curtains fell on the wait to win the "El Calssico". Puyol did well to win the initail header from a Xavi corner and the ball fell to Eto who reacted quicly to get the ball past goal line. In the 88th minute Hleb was brought in for Eto. In the 91st minute Keita came in for Xavi. In the 92nd minute Messi seals the victory by chipping the ball over an advancing Casillas after Henry placed the ball in Messi's path from a counter attack started by Hleb. This victory leaves us nine points clear off the rest of pack. Villareal have a chance to bring the gap down to six points tonight. This may not have been a performance everyone was hoping for, but then nobody expected to have Real Madrid playing like a second division side. 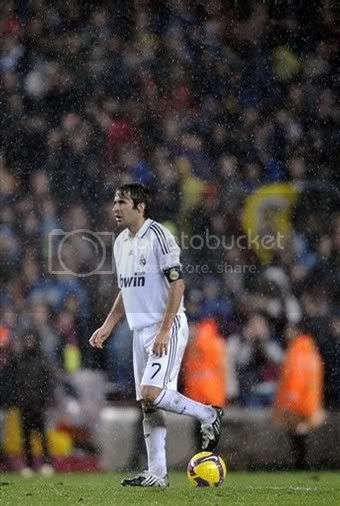 There was a lack of pace in the match which was majorly due to Madrid keeping Xavi very quiet. Gudjonsen had a good night but was unable to substitute Xavi's creative skill in the middle. 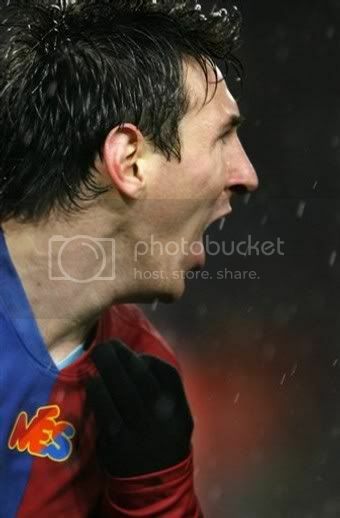 Messi was kicked out off attack and he suddeny went quiet. But there are good news with Iniest coming back and we will have more options in the middle of the pitch. The best players for me were the defenders along with Toure. Have a look at this article from Guardian - why are Barcelona scoring so many goals? Camp Nou prepares to host the biggest game of this season so far, El Classico. Yesterday FIFA has shorlisted both Messi and Xavi for the FIFA World Player of the Year final list. Guardiola is once again upto his best with the squad announcement. As usual he has delayed the squad announcement to keep everyone guessing; but this time he has added another twist to the usual tale. He pointed out a possibility of Iniesta making into the squad for "The Classic". Guardiola told the press that Iniesta will train along with the other members of squad in today morning and his inclusion will be decided after that. Now that's Guardiola's way of keeping everyone guessing. Barcelona's current form has raised huge expectation among Barca fans, who dearly want revenge for the last season's 4-1 defeat at Bernebeu. BUt it will be foolhardly to dismiss Real Madrid's chances in this match. Madrid players along with their new coach would be motivated to silence their critics and there is no better way to do that with a win in Nou Camp. FC Barcelona players has to take the match very seriously; if they do that this could be a cake walk as half of the Madrid side is out injured. But then as we have seen in many occassion in the past, over confidence and complacency could be FC Barcelona's biggest enemies. As Di Stefano mentioned "All the pressure would be on Barcelona". Real Madrid would be without any pressure as nobody give them a chance to beat in-form Barcelona at Camp Nou. So there could be a chance of the Barcelona side melting under the huge pressure. To predict the line-up against Real Madrid is pretty simple. There is no way that Guardiola is going to change the line-up that demolished Valencia. So we can expect Abidal, Puyol Marquez and Alves to guard the defense ahead of Valdes. Xavi, Toure and Gudjonsen will form the midfield. And the deadly trio of Messi, Eto and Henry will be form the forward line-up. For everyone this match is about attack; there is no doubt thet we will see goals in plenty. But for me the key would be theree players - Alves, Toure and Abidal. If they produce a performance as similiar against Valencia, then we would be shutting off Real Madrid completely. My predition for the match is a 6-2 victory for Barcelona. Ok, it may sound pretty impossible, then Real Madrid's defense has looked suspect whole of this season. FC Barcelona is destined to have a tricky opponent in the first knock-out round of the Champions League. Since FC Barcelona has topped the group they will be playing one of the team which came second in their respective froup. But that is no sigh of relief as the potential opponents of Barca are Arsenal, Inter Milan, Lyon and Chelsea. Now that's pretty tough. I would personally like to have Lyon facing us rather than any of the other team. BUt if history is taken into consideration, this could turn out to be yet another Mourinho versus FC Barcelona match. Real Madrid who is Barca's next opponent in the League did play well and demolish a Zenit team. We have seen many times that a change of manager works wonder atleast in short term and hence the team should take the Real Madrid match more seriously. Even with all their apparent problems and injuries nobody will deny their resolve. They have grinded many results with astonishing come back this season and it would be good for Barcelona to take them very seriously. The recent statements regarding this made by many players sounds good; everyone of them want revenge for the twin loses of last season. It seeems everyone in the squad is ready to put that extra effort to avenge that defeat. All good things comes to end so does FC Barcelona's unbeaten run. A substantially understrength Barca side has been beaten by a highly competitive Shaktar Donetsk side; Shaktar now have qualified for the UEFA cup. There is no need to ring any alrm bells as none of the starting eleven players would be starting against Real Madrid. In the preivew to the match I have written that the match will be decided how we handle the physical strength of Shaktar player's. Shaktar made most of their oppurtunity from counter attacks. Guardiola gave Jorquera the oppurtunity to guard the goal. Ahead of him Caceres, Sanchez, Pique and Sylvinho formed the defense. The midfield was made up of Vasquez, Keita and Busquets. Pedro, Bojan and Hleb made the front three. Galdkiy scored twice in the 31st and 58th minute to take Shatar two goals up before Sylvinho pulled one back in the 59th minute. In the 75th minute Fernandinho increased the lead back for Shaktar. Eventhough Busquets reduced the lead in the 85th minute, Barca never managed that crucial goal to keep their unbeaten streak alive. From the player's perspective Pedro showed much enthusiasm and skill; Bojan was really hard working but a very physical Shaktar team kept him on bay. Caceres and Jorquera had a forgettable night, both were at fault for most of Shaktar goals. Sylvinho showed that he is a handy back up to have in the left back position. FC Barcelona and Shaktar Donetsk players practicing ahead of their Champions League clash.